Its time for a treasure hunt on Sands of Fortune Slots! This egyptian themed game from Eyecon comes with an exceptional Bonus feature where huge wins can be earned! 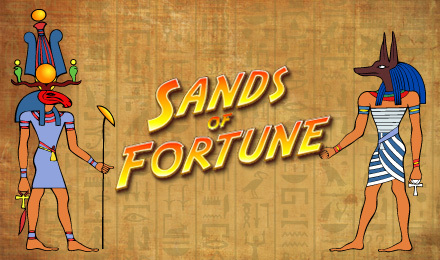 Sands of Fortune Slots is a marvellous 5 reels, 9 paylines game by Eyecon, with a 93.76% RTP. Go on an exciting adventure in Ancient Egypt to hunt for lost treasures on its reels. The Wild symbol replaces all symbols on the reels apart for the bonus symbols. Trigger the Bonus Feature with 3 or more Bonus symbols where you can pick between 3 corridors to win prizes when an artefact is revealed. Each time you choose the right corridor, you will get to pick from 3 more doors and earn more prizes. Beware of the skull as it will end the feature.